The tip of Manazuru peninsula has been designated as a natural monument of the prefecture. 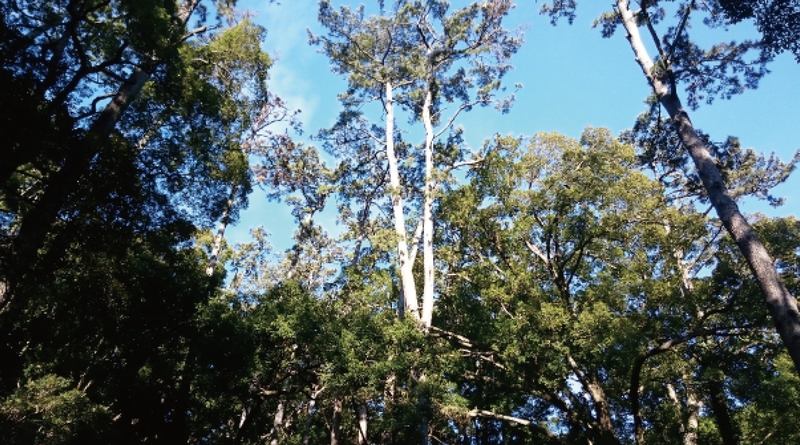 Many plants thickly grow in the laurel forest such as the Japanese black pine, camphorwood and chinquapin. This began with the planting of Japanese black pine back in the mid Edo period. 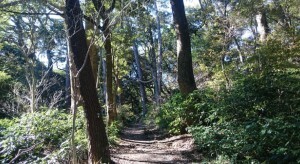 People regarded this forest as a forest that gathered fish and called it “Ohayashi”. It was carefully protected from olden times. The sea of Manazuru is bountiful with fish from the “Forest with Fish*” Ohayashi forest and the rocks on the seabed. 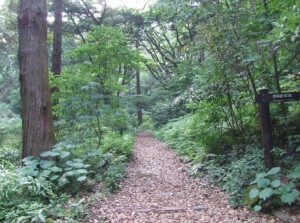 *Forest with Fish… It is a type of protected forest. A habit for marine life is created by dropping the shade of trees into the sea. This has the effect of attracting fish to the area. About 350 years ago (mid Edo period), there was a huge fire in Edo (now Tokyo). The start of the forest began with the planting of Japanese black pine in order to compensate for the shortage of lumber for reconstruction. 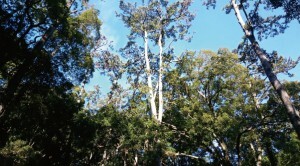 After becoming the imperial family’s forest, it was given to the town. Because the forest was protected without being developed, many living things thrive here. Along the promenade in the forest, there are Japanese black pines that are over 300 years old and giant camphorwood trees with diameters over 7 meters. The sea of Manazuru nurtured by thick lava. 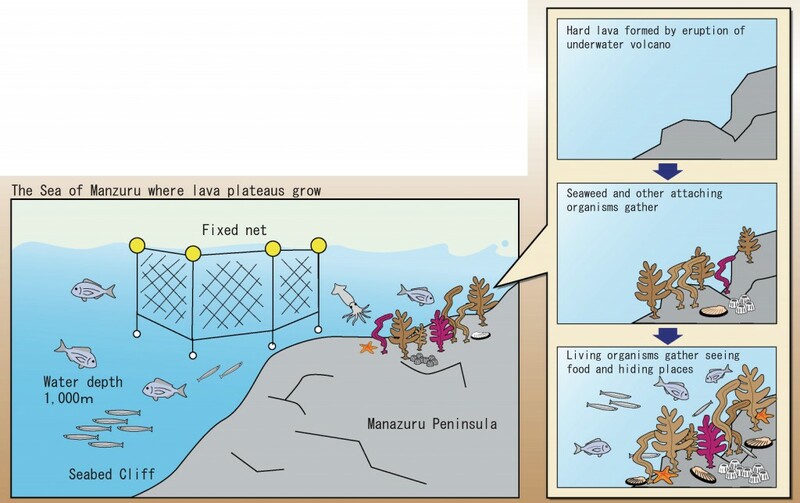 The Manazuru Peninsula is covered by lava 50m or thicker and many living things live here. Tropical organisms also flow into here from the Kuroshio Current. There is a submarine escarpment called the Sagami Trough that originates from a depth of 1,000 meters. For this reason, the depth of the water becomes deep rather abruptly and because of this Kurile Current organisms and deep sea organisms inhabit here. Marine life from the north and south, deep seas and shallow seas, all inhabit this sea. Flourishing fixed net fishing is managed here. It has provided a great blessing to Manazuru.